Stoked to see a great article on the Weber River in the latest issue of The Drake Magazine. If you haven’t already, Check it out! 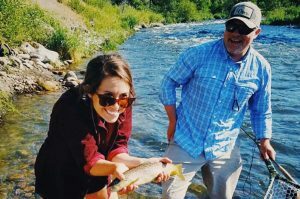 Fly Fishing in Park City has been excellent throughout the first half of July. Our local rivers and streams have settled down and normalized from the intense runoff we had this year. Most, if not all, of our reservoirs are at or near capacity. This could certainly bode well for the health of our fisheries, especially if flows are managed consistently and in a manner to keep water temps down. Drakes – The Green Drake hatch has been sporadic. However, they are around and fish are on them. Look for cooler overcast days and you may see a more intense hatch. The Uinta Basin has had good hatches and in places, the hatches are still very robust. PMD’s – as the rivers settle into a consistent flow these bugs will start to hatch until there are no more eggs to hatch. This could last well into late summer early fall and it is a mid summer mainstay on our systems here in Park City. Be prepared with a variety of patterns, trout are feeding on them in their nymphal form and most hatches have been popping between 1-4pm. Again, cloudy cooler days (if we have any in our near future) will help the hatch along. Midges – We have had great success fishing midges larvae and pupae under an indicator for the past cpl of weeks. A variety of colors, shapes and sizes have been working. Don’t leave home with out a variety of patterns, especially if you are fishing on the Middle. We have seen some great midge hatches early to mid morning and in certain spots, guests have had some great dry fly eats. Caddis – Caddis are popping on most days and recently we are seeing good activities in the riffles and pocket water. When it is sunny and warm outside the fish will seek more oxygenated water. Try an olive x-caddis in the riffle next time you are on the water. We are in the thick of it and the fishing should be peaking almost anywhere you decide to go. Be sure to check your weather and flows. There is still a lot of water, so be cautious when attempting to cross. Keep hydrated and keep getting after it. If you have any questions or would like to book a guided trip, give us a call! High water got you down? Let us help you out with this fly selection primer. “Memorial Day Weekend” Edition. A few of our favorites from top to bottom. 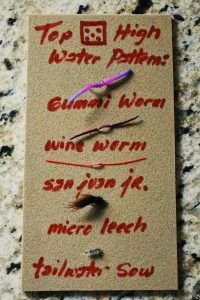 “The Gummy Worm”, “The Wine Worm” and “The Son of San Juan” are all excellent patterns if you’re trying to match the current worm hatch. The “Micro Leech” is our go-to for big trout and viscous takes. And finally, the “Tailwater Sow” is a classic and steady mainstay in our boxes. They’re all super tasty – and proven as well. Yes, some purists will scoff at you. But, at least you’ll be catching fish. No need, to over think it! High water and runoff continue to dominate the local river scene. 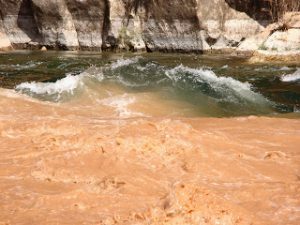 Both, tailwaters and freestones are currently affected and we would anticipate this pattern through the first half of June. There is still a lot of snow in the high country. Despite the high water, good fly fishing can still be had. It will take some work but there are good chances at fish if you know what you are looking for. Look for holding water, trout will escape to protective cover or conditions that shelter them from the overwhelming current. Be thoughtful and observant, you may be standing in their holding water. Not too many bugs in the air? Restructure your match the hatch mentality. Think of what the river is doing right now and triangulate what kind of food sources may be available. The river has been pretty empty, but you may have to get there a little earlier. High water makes for fewer places to fish. Seeing something on the other side of the river that looks promising? Save it for later and lesser flows. DO NOT cross. It is dangerous and you’ll most likely die. Be patient, these flows will eventually come down and we’ll be rewarded with a healthy and re-invigorated fishery. We know it is tough, however these are conditions that ultimately make us better anglers. Keep at it and if you need any pointers or would like to book a guided trip, give us a call! River flows in the Park City area are beginning to increase. Bookmark our Resources Page for “One” convenient place to check flows throughout the season. Inclement weather can pose serious health hazards if you are unprepared. Take a few minutes and give the forecast a thorough inspection. Layer and dress accordingly and don’t be afraid to pack a change of clothes. It pays to use a little common sense. Be aware of the risks, plan for things to go wrong and know when it’s time to change the plan, even if it means spending the day tying rather than fishing. Here’s a fact. Winter mornings are generally cold as f*ck! We know it and the fish know it. The best bet is patience, wait a hour or two. As the sun rises higher in the sky the temperature will increase and so will the activity levels of the fish. Think mid-morning thru mid-afternoon as your optimal window for success. We schedule all our winter guide trips from 10 -2. Tailwaters! Tailwaters! Tailwaters! 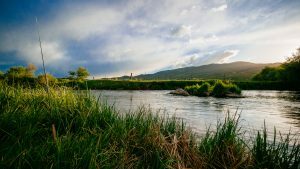 The Lower and Middle Provo River are both excellent local choices here in Park City. Look for slower moving runs with good depth. 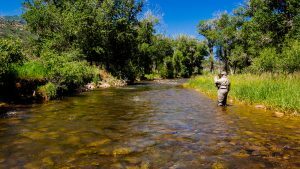 Trout will pod together in these deeper runs. Also, look for groundwater springs with warmer water flowing into the main body of the stream. Size #26 and #28 can be the norm. With such small flies and clear water, 6 and 7 X is generally required. Good drifts and accurate casts will also increase your chances. Most fish will be reluctant to chase, move or exert any energy to acquire a small morsel of food. Be “midgecentric”! If you are unsure what this means, please book a trip with us so we can get you on the right path. Both surface and sub-surface patterns and techniques can be effective in the winter months. In the end there are two pieces of winter gear that will insure a successful and safe day on the water. Trust us, having a high quality thermos with some kind of high quality hot drink or soup in it will surely save the day when you get back to the truck. And in the end, there is one piece of safety gear you should take with you any time things look like they could get sketchy, or even when they don’t. A fishing buddy. The only thing better than surviving a cold weather fly fishing event is having a friend to tell the story. We’re usually skiing by now in Park City. However, we are enjoying what the month of November has provided for us so far. It has been pretty mild as Novembers go. There hasn’t been a ton of nasty weather, which has resulted in a fair amount of nice days to be out on the river. Blue Wings and some limited caddis are still providing opportunities on the Middle Provo River. Size is critical and it seems most of the Blue Wings are somewhere in the #22-#24 range. Pretty small and hard to see if you’re throwing the dry. Tippet size matters too, 6x-7x is mandatory. You may be able to size down to a bigger bug and heavier tippet on a cloudy day. However, the trout have become quite keen and selective. Honestly, we are hoping for a strong and robust winter! As much as we don’t complain about having guide trips in February, we would much rather have plenty of water next summer. 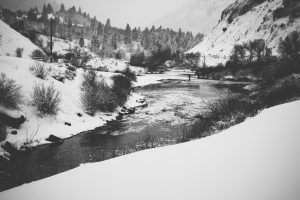 Winter flows are in full effect on all of our rivers and streams. Everything is low but pretty normal, except for the Weber River. It is flowing at 33 cubic feet/sec. out of Rockport. In our opinion, that’s a little too low for the long term health of the fishery. Hopefully they’ll find a way to bump it up. Regardless, we recommend giving it a break until higher flows return in the spring. The Middle Provo is at 150 cubic feet/sec. and the Lower Provo is at 100 cubic feet/sec. Most likely this will be the last conditions report for a while. Once the fall hatches conclude there isn’t much worth commenting on. However, we will keep thinking of things to write about on our Resources page. We would like to thank you all for supporting us in our endeavor. We hope you were able to enjoy your friends and family over the holiday. Look forward to our Holiday Gift Guide, appearing sometime soon. Park City Fly Fishing At Its Best! Autumn has arrived and it is a great time for a quiet escape. Not to mention, one of the most beautiful times to visit the area. 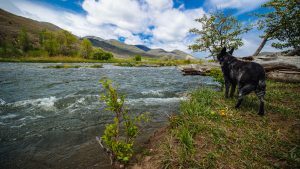 Recently, the flows have dropped on the Middle Provo River and this week’s cooler temperatures and stormy weather should start to get our local Baetids cranked up. One of our favorite Provo River hatches, these mayflies hatch in prolific numbers. As nymphs, they are outstanding swimmers, but they tend to struggle with their mobility as they begin to transition and emerge as adults. At this vulnerable stage, they tend to be easy targets for trout as they struggle to the surface. Hence, some of our favorite flies are emerger and cripple patterns. A few of our favorites from top to bottom. 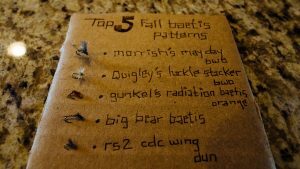 Morrish’s May Day May and Quigley’s Hackle Stacker are excellent dun/cripple patterns. The Big Bear and RS2 are classic and steady mainstays in our emerger boxes and the Radiation Baetis is a newbie, just recently added to our nymphing rotation. There will be a sweet-spot for this hatch. As time passes its intensity will wain. That first week to 10 days is always the best. So get out there and enjoy yourselves! It won’t last forever. Another week of hot and dry conditions hasn’t done us any favors here in the Park City area. The past couple of weeks have provided some good days locally, however it has required some imagination. Small patterns, light tippets and slow inside drifts have been the program. As of August 17, flows have been elevated on the Middle Provo River to approximately 600 cfs. That is a lot of water any time of year and it will make for challenging wading. You will have to adjust your tactics and I wouldn’t expect the fishing to get any easier. The good news, is that it is good for the fishery long term and the elevated flows should make for some excellent fall fishing. No doubt, there are still hot and dry conditions in our immediate forcast, but I am starting to feel a slight chill in the air when the sun goes down. Next week looks to be bringing some overcast days and lower daytime temps. This will be beneficial for our remaining caddis and PMD hatches. Pay attention to your weather. It could make a signifigant difference, especially if you’re looking to throw a dry fly. At this point, terrestials should definitely be a part of your game-plan. I have seen some good numbers of hoppers around, specifically in the Uinta Basin. Long leaders, fine tippets and a reach cast will benefit you greatly. I would strongly encourage dropping down one tippet size than what you normally use. Crowds are down and there really are less bodies on the water. If and when, you do get out, pay attention and maybe avoid the runs where fish are getting pounded day-in and day-out. Try a micro worm or leech in the faster water and don’t neglect the pocket water, you may find a fish or two willing to rise to your presentation. Especially, on those cooler overcast days. As always we are looking forward to fall fishing in Wyoming. Currently, we have decided to move our fall trip dates back a couple of weeks. Flows on the Upper Green are at a good level, but the water temps are a bit high for successful fish release. If you are considering getting up there we would strongly recommend waiting til the end of September. Otherwise you WILL be putting those fish at risk. We are currently booking dates from September 23 – November 14. We would love to fish with you and prime dates are still available. Give us a call 435-631-9933 or book with us online at www.parkcityflyfishingguides.com. There is not a single moment, throughout our fishing season, when our rivers and streams are more alive with insects and active feeding fish. Runoff has peaked and flows are beginning to normalize to consistent summer levels. The middle section of the Provo River has cycled through a much needed flush and we’re beginning to see consistent hatches of big bugs on this system and throughout the Uinta basin. In fact PMDs, Drakes and Stoneflies are generating good fly-fishing opportunities almost everywhere. Thunderstorms, cooler temperatures and overcast conditions are in our immediate forecast and these days will serve as a catalyst for excellent mayfly hatches. 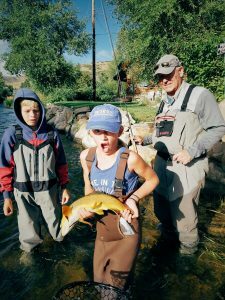 It is the Fourth of July this weekend and we anticipate a heavy dose of angling pressure, especially on the Middle Provo. So, be patient and respectful of one another. Get there early, find your water and throw some pmd spinners while you wait for the Drakes to pop. Recent productive Drake patterns – “Hairwing Drake” sz 10 and “Laser Pointer” sz 12. Don’t forget the Weber. These weather conditions could be a game changer with the PMDs. Regionally, the Upper Green is beginning to come down and we are starting to witness ideal conditions for dry-dropper fishing, especially from the boat. Water temperatures seem to be holding and the next two to three weeks should provide for some truly excellent shots at big fish. PMDs, Yellow Sallies and Caddis are plentiful throughout the system. We still have some prime dates available and welcome any and all inquiries (435-631-9933). Enjoy your holiday weekend and we hope to see you on the river!